Very loosely based on the classic children’s book by Judith Viorst, Alexander and the Terrible, Horrible, No Good, Very Bad Day exists in a genre we don’t see too much of anymore, the live action family comedy. That alone makes it kind of a breath of fresh air, and the film is a pleasant enough diversion for its brisk 81-minute runtime. The film centers around the title character of Alexander (Ed Oxenbould), his parents (Steve Carell and Jennifer Garner), his sister (Kerris Dorsey), his older brother (Dylan Minnette) and his baby brother. Everyone in Alexander’s life seems to have it all together, from job interviews and promotions, landing the lead role in Peter Pan. Alexander, on the other hand, seems to only have bad days. Early in the morning on his birthday, he wishes his family would have a bad day. And so they do, when each of them has a big milestone to hit. I have to say I wasn’t expecting much from the film based on the trailer, but Alexander and his family were quite a pleasant surprise. oscillating between corporate woman and mom easily (just like real life!). The kids are charming, and the film’s pacing is note perfect. 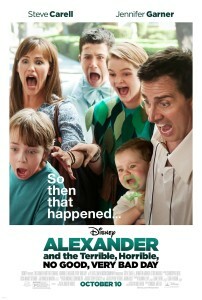 Alexander and the Terrible, Horrible, No Good, Very Bad Day opens today in Philly area theaters.